The FANTASY BASEL - The Swiss Comic Con is the biggest pop culture event in Switzerland and one of the most beautiful in Europe. With over 60,000 m2 and a unique programme, it is also considered by visitors from distant galaxies to be one of the most beautiful comic con's in the universe. Creative creators and fans celebrate three days together in a real and imaginary world the fascination of creativity and fantasy! Immerse yourself in the world of cinema films, TV series, games, eSports, comics, cosplay, walking acts, contemporary urban art, game design, anime, exhibitions, film props, artist alley, science fiction, fantasy, virtual reality, stars, photo & autograph area, panels, shows, movie cars, merchandise, manga, steampunk, you tuber, graphic design, board games, tabletop games, latest entertainment electronics and much more! - Access Friday at 11.30 a.m. and Saturday & Sunday at 9.30 a.m. through separate VIP entrance. - An exclusive anniversary postcard set with works by various artists. 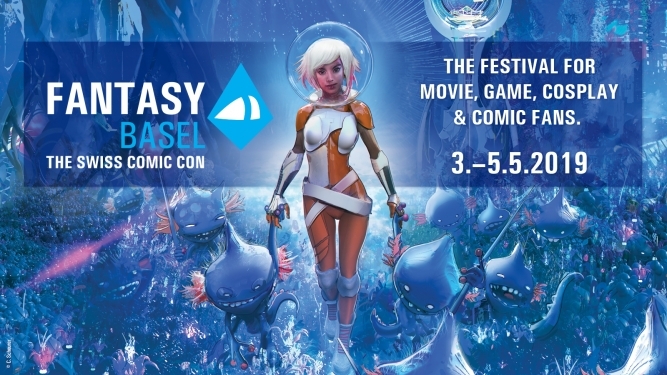 - Admission to the FANTASY BASEL - The Swiss Comic Con VIP Party on Friday, May 3, 2019, from 9pm - 10pm in Hall 2. Owners of Golden Tickets are also supporters of FANTASY BASEL and support the organizer to make this event possible. - Adolescents up to the age of 14 must be accompanied by an adult. - You must have identification with you at all times. - No exchange or take-back of tickets possible. - Selected panels and side events require separate tickets (these will only be sold after the announcement of the respective events).